Routing Mojave 18-4 on the road Tuesday, March 19, Boulder City High School’s softball team has won three straight games against Nevada 3A opponents after a heartbreaking loss to Pahrump Valley on March 11. (Robert Vendettoli/Boulder City Review) Abby Giunta, a senior at Boulder City High School, throws a strike against Western on March 13 in the Lady Eagles' 19-4 victory. Giunta struck out four batters on the day. Providing plenty of run support so far this season, the Lady Eagles also routed Del Sol 18-0 on Monday, March 18, and Western 19-4 on March 13. “Winning the three games is boosting our confidence and showing our team that we can really go far this season if we work together,” senior Ryann Reese said. Reese has been on a tear lately at the plate, batting 4 for 5 with four runs batted in and a home run against Mojave, while batting 3 for 3 against Del Sol and 2 for 3 with three RBIs against Western. Matching her intensity at the plate, senior Abby Giunta batted 1 for 3 with an RBI against Western, while finishing 2 for 2 with an RBI against Del Sol and 3 for 4 with three RBIs against Western. Collecting all three wins, Giunta pitched a total of 12 innings, allowing eight runs with 12 strikeouts. Sophomore Sydney Krumm batted 3 for 3 with four RBIs and a double against Del Sol, freshman Lily Hood batted 3 for 4 with two RBIs against Mojave and freshman Samantha Bahde batted 2 for 3 against Del Sol, giving the Lady Eagles an added boost from their underclassmen. 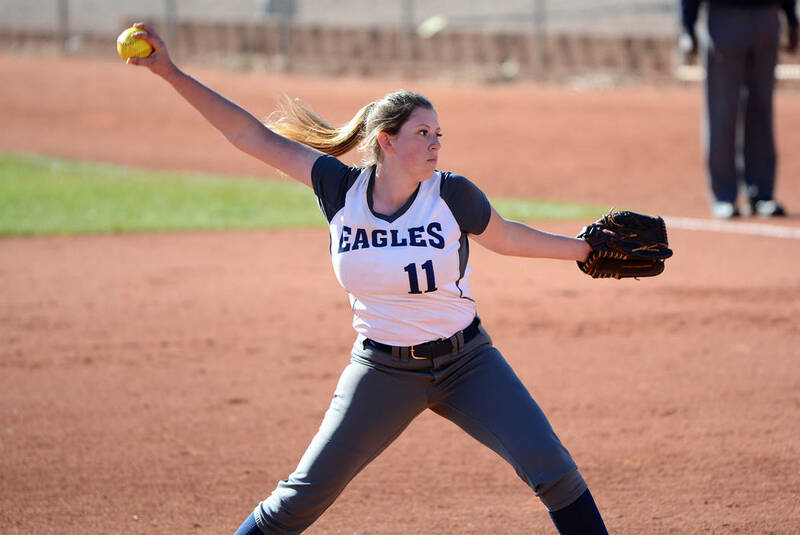 Already solid against Nevada programs, the Lady Eagles traveled to Utah for the March Warm-Up Tournament on Friday and Saturday, March 15-16, where they finished 1-4 against a handful of quality teams. Defeating South Summit 10-9 in the tournament opener, the Lady Eagles remained competitive despite their record, narrowly falling to San Juan 17-16. The Lady Eagles suffered losses to Stansbury 18-11, Uintah 13-1 and Cedar 14-5. “After losing to Pahrump, then having a rough weekend in St. George, we are trying to work off mistakes and get better,” Moorhead said. Getting four more preseason games to prepare for league play, the Lady Eagles will resume their season Friday, March 22, with a home game against SLAM Academy and another on Monday, March 25, against Democracy Prep, before traveling to face 4A opponents Coronado and Silverado on Tuesday and Wednesday, March 26 and 27.